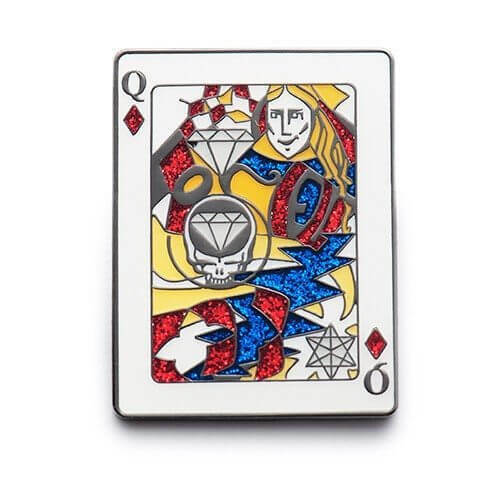 In creating a custom glitter enamel pin, coin, medallion or keychain, you have so many choices to make. Finish, texture, attachments, packaging… but it's the bling that gets them every time! These special touches take your design to the next level. 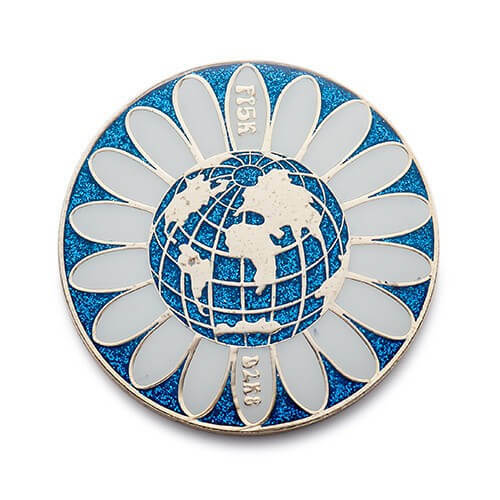 Especially popular with the trading pin crowd, adding bling can heighten visibility, attractiveness, and value to your custom product. A mixture of colored glitter and paint enamel is added to the recessed areas of your pin or coin and then coated with an epoxy dome to protect the glitter and add a brilliant shine. The glitter sparkles in even the faintest hint of light and adds an extra sparkle to your already shimmering design. 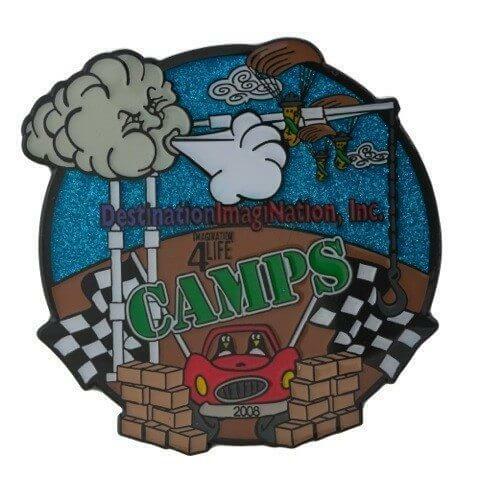 It's a must-have for school Trading Pins! Glitter is made of tiny little sequins (often the size of a pepper flake) that reflect light. Many of us have known glitter since elementary school with our craft projects or on Christmas decorations. Because of its brilliant effects, glitter is also widely used on baseball trading pins that are traded at Cooperstown, PA every year. 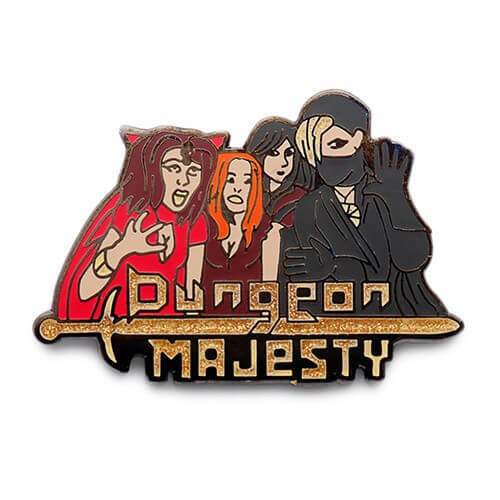 What Kind Of Team Pins Do We Make? Glitter is often used to set off the teams name or to highlight its mascot. It comes in a variety of colors, including red, blue, yellow, green, orange, pink, black and white, to name a few. You don't have to limit your glitter choices to one area. You can put glitter in as many places as you like. Typically, glitter only costs 15 cents per custom trading pin. 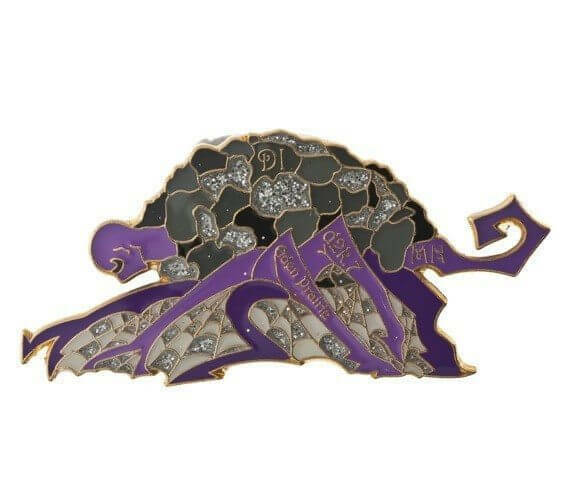 However, for example, if you wanted glitter in the sky and on the mascot on your trading pin, then it would cost 30 per pin because it is added to more than one detail of the pin. Anyway, you look at it, all that glitters is gold. Glitter catches the sun and makes your custom trading pin shine! And what shines is considered valuable! The flashier the pin, the more other team members will want to trade for it! It might seem very cliche, but let's face it, little girls and glitter go together like bread and butter. The clothes, the fun dress up makeup, the artwork… All of it made better with glitter. Tiny chips of reflective color that make things brilliant and shiny are a must have for parties and holiday celebrations. We think that this is likely the reason why we are seeing such a high volume of orders that are intended to be given out at birthday parties and celebrations. Blinking LED lights commonly referred to as “Blinkies,” have been a very popular addition to trading pin designs for years. To create the blinking effect, a small light bulb (LED) is placed on the trading pin, which is connected to a hidden battery box attachment on the back. When turned on via a small button, the bulb begins to blink. To make your trading pins even more special, multiple Blinkies may be added. Since this feature is one of the more expensive additions, it’s not as common as the others and will really help make your trading pin stand out. A bobblehead is a second pin that is connected to the main pin using a spring attachment instead of a chain. The spring enables the “bobbling” action of the pin. This feature can be used in many designs ranging from making a player’s head bobble to having your team’s logo spring off the state you are from. 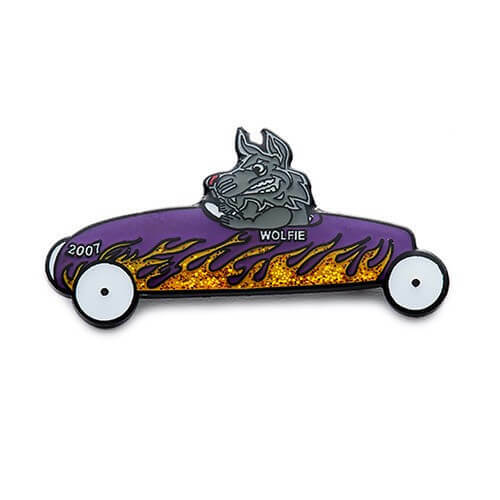 Spinners pins are the rarest of the accessory pins. A spinner pins a second lapel pin that is attached through a hole in the main pin and capped off, allowing it to spin freely. spinner pins can be used to create movement in the wheels of a car or a hurricane hovering over a team’s home state. The rarity of this feature causes it to make spinning trading pins highly tradable. Sliders are secondary pins that are attached to the main trading pin via a slot. 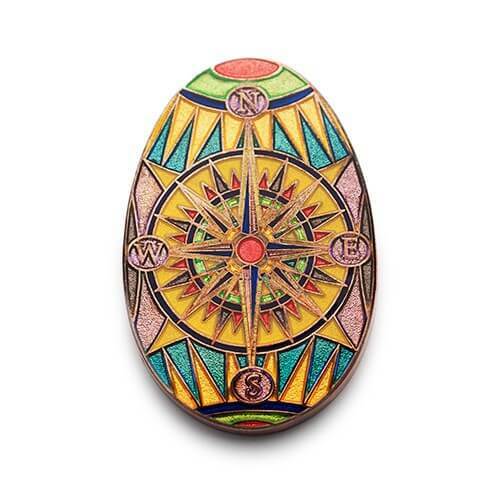 The secondary trading pin is able to slide a short distance along the pin, adding movement to the design. This addition is great for making a player slide into a home base or showing a spaceship lifting off into space. Another cool idea to customize your trading pins. A dangler is a secondary pin that hangs off of the main pin. Danglers are essentially a second custom made pin designed to accent the design. 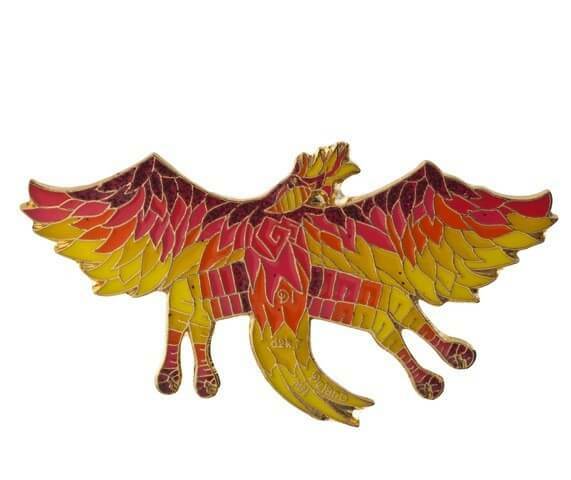 They are one of the more traditional pin additions but are still popular and highly tradable today.